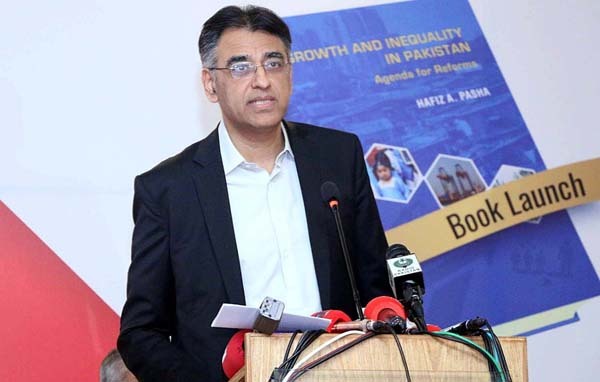 ISLAMABAD, Apr 2 (APP):Federal Finance Minister Asad Umar on Tuesday said with a purpose to lead the country’s economy towards sustainable growth, the government had drafted a medium-term economic framework, which would be shared with the parliamentary finance committees, political parties and other stakeholders for feedback and suggestions, Speaking at Pre-Budget Consultations and Book Launch titled “Growth and Inequality in Pakistan”, the minister said the previous government had been talking about the Charter of Economy but never took up the issue in the parliament. The minister said he had personally suggested the committees to utilize their forums for developing a medium-term economic framework. Even if consensus could not be developed on the framework, still the government might get productive feedback and suggestions, he added. He said the committees responded positively and he was assigned a duty of drafting the framework, which he did and would share the same with the committees, political parties and media within a couple of days. Talking about the policymaking processes, the minister said economic decisions should be based on sound economic theory, more importantly on empirical research and not on self-interests. He said the main issue being faced by the national economy was ‘elite capture’, which influenced economic decisions, expressing the hope that Pakistan would now tread on a different path and mitigate the ‘elite capture’. Talking about budgetary recommendations, he said the proposals proposed by Hafiz A Pasha in the book were already included in the government’s agenda. He said withholding taxes should be eliminated. The government was working towards that direction as most of the 41 such taxes listed in book would be eliminated. He said the Capital Gains Tax (CGT) should also be implemented on property and also favoured inheritance tax as proposed in the book. Even after paying all the taxes, if an individual had residual wealth over certain limit, he should pay its taxes as a social obligation. The minister stressed the need to raise the issue of capital secrecy at global level, saying if a labourer had to go through every procedure to find a job in the international market then why same principles were not applied on capital flows. Talking about the economic growth during the tenure of past government, Asad Umar said the average growth of 4.5 percent as claimed by the previous government was a jugglery of figures. He said Pakistan needed growth momentum and could not afford to be caught in low growth trap. He said when the incumbent government took over the central reserves were around $1 billion and per month current account deficit was $2 billion, and slow downing of growth was necessitated to save the economy from bankruptcy. He viewed that political confrontation was not good for economy as it was having negative effects. He, however, added that proceedings against elements involved in crimes was not economic confrontation but upholding the rule of law, to promote a transparent image of Pakistan.